If you use Google Chrome or Firefox, you probably already use our add-on to add bookmarks on the go or to access your bookmarks through it. Start typing the bookmark you want to search inside, for example “wikip”. The first result should be Wikipedia, unless you have something else starting with “wikip”. Press “:” and then type what are you searching for, for example “titanic”, and press ENTER to submit. It will open Wikipedia with the “Titanic” result in it. The best of it all, is that you can combine shortcuts with direct search, so instead of typing “Wiki” you can just press “W” (assuming W is the shortcut) and follow the same steps afterwards. 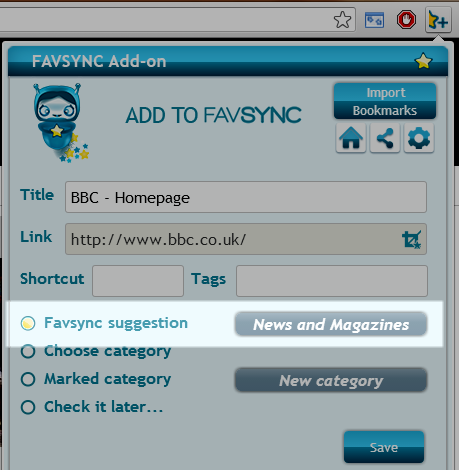 Users who use the add-on have probably noticed that the first choice where to store the bookmark is FavSync suggestion. If you wonder how it works and how we know which category to suggest, this post is for you. Unfortunately, I cannot share the secret recipe, but I can definitely say that it’s not as easy as just creating an internal library of links or just grabbing the metadata of a website and categorizing it, since the metadata usually contains a lot of useless keywords. In fact, we are using a combination of different algorithms and one of them is the analysis of the metadata, but that’s just a small part of the whole logic. The second part requires us to analyze the categories on your FavSync page and see which one fits the best. We do that by analyzing all the bookmarks in that category or by the title of the category. We are constantly improving the accuracy of the suggestions, however sometimes you might get Unsorted as a suggestion. That means we didn’t manage to analyze this bookmark and it will store it in the Unsorted category (from where you can move it afterwards, of course). You can also choose a category directly when adding a bookmark, if the suggestion is not to your liking. If you ever worked on a project together with a friend or a colleague, you might have experienced the pain of collecting data together. You start by sending e-mails to each other about any useful article and website you found, then sometimes send a message in Skype and end up sharing a link in Facebook. It can become a bit frustrating finding all this stuff back when you actually need it. How about organizing a trip with your wife? Or looking to buy a product online together? Or just collecting great music websites with a friend that shares your taste in music? Today I would like to show how you can easily collect bookmarks together on FavSync and perhaps save you a lot of headache in the future. At the bottom left corner of each category you will find the sync button. Click on it, fill in the email address of the person you would like to sync it with and that’s it. If the recipient is already a FavSync user, they will receive a notification on their FavSync page and an e-mail notification. If not, they will receive an e-mail invitation, when the user will sign up, the category will already appear on their FavSync page. From now on, whenever one of you finds a useful website for the project, it will be automatically synced between you two. This is the difference between a one-time share and between collecting together. - You can collect bookmarks with as many users as you want. - You can sync different categories with different users. - You can set permissions for every user in the category. - You can add notes about the added bookmark.